A stress fracture had forced me to take three weeks rest from walking, and in the time we’ve been away from the hills, spring has almost arrived. The air is a little warmer; there’s a weak heat in the sun. There are tiny, perfect snow drops, and early buds and blossom are beginning to dot branches. Crows and Jackdaws are already sitting in pairs, inspecting what remains of the nests in their ancestral rookeries. It’s been a long winter, and a soaking, rain blasted summer before it. For now, there is potential, and hope, and optimism: the markers of spring. At last. We begin in the village of Chinley, nestled in the Dark Peak. Towering above the village is a stepped hill we know well: Chinley Churn. It was here that our walks began, nine months ago. On a day full of new potential it seems right that we’re back here. From the village it is a steep climb; below rookeries busy with course calls that always wake some deep ancestral joy in me; they are the timeless sound of the wild, and in their own societal connections to the earth I see my own. We take a sharp turn right up a narrow track. The banks and walls are deep and flanked by trees, already laden with fattening buds; the effect is of climbing upwards through a tunnel. We climb for five minutes, ten. For the first time in months I remove my snood, and then my coat. I roll up my sleeves as the breath comes quicker through my lungs, feeling the faint warmth of the sun. It’s glorious. At the first plateau in the climb, the walls fall away and finally the valley is laid out below; the steepness suddenly apparent, and it is breath taking. Smoke curls from the opposite hillside, miles away. Hazy sunshine fills the bowl of the valley and glints off distant roofs and windows. I notice small clouds of midges dancing, just above to the still-brown heather that fringes the path. Spring is coming. We push upwards, past a farmer’s field full of old cars laid out in rows; a kind of field-bound rush hour. Further up still, warm now and breathless, we reach a wide flat ledge called Kraken Edge, which swings left and up, the next valley falling away vertiginously below and to our right. This leads to Kraken Quarry and mine; closed in the 1950’s. Here at the top of the hill, the valley walls sloping steeply down below, the landscape is littered with slate, piled high, built into precarious walls and crumbling huts. The remains of quarry buildings are everywhere; an abandoned stone village populated by sheep. When men worked up here, they would travel a track so steep and poor that visitors refused to return. Today we don’t linger here, though I love to explore the high walls and paths of the old quarry (and one day, the cold shafts of the mine). We head right, to a path that barely clings to the side of the hill, the valley floor a thousand feet below. As we climb, we see signs telling us the footpath is closed due to recent landslips; a result of our soaking winter. 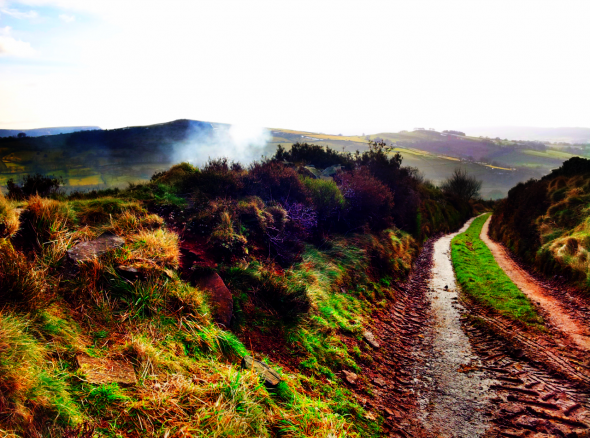 The path does, clearly disappear; leaving a treacherous and uneven climb on sheer slopes. These are the fun bits. The moments when your heart beats faster and you are truly, completely present. Every step and movement is considered, deliberate. There is nothing else that matters but this moment, this jutting rock that will support you, or will give and send you twisting out into space. 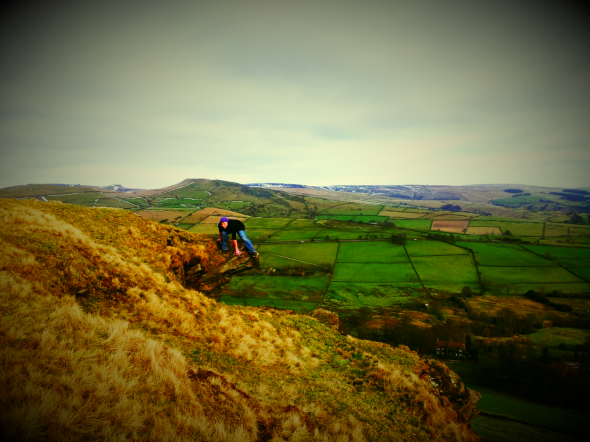 And so we climb, and finally reach the wide flat top of Chinley Churn. Up here, it is still winter. There is snow clinging to the hill in ditches and along walls. I press my face into it, feeling the sting of it, and roll down, over the edge of a slope that is still frozen for now. Snow cushions; it lets us move in new ways across the landscape with less fear of falling or slipping; opening up new chances for play and exploration (a joyous cross-species phenomenon) . It’s colder up here, and the wind is biting, turning the bare flesh of my arms numb. It’s time to head back; a short walk. Not yet truly out of winter, it’ll be dark in a couple of hours. We take the highest path back; over the top of the quarry and steeply down through fields that we know will soon be filled with deep pink fox gloves. There is a spring that bubbles up beneath a hawthorn tree here; I imagine the quarry men using it for fresh cold water. When the foxgloves return, this is a magical spot, a timeless fairy-tale place that is made for spring and summer, and makes me feel both very young, and endlessly old. We rejoin the lanes that lead back down to the village, feeling warmer again and chased by drifts of crows as they gather for night. For now, they’ll sleep in their winter roost. But we’re all of us waiting for the spring. 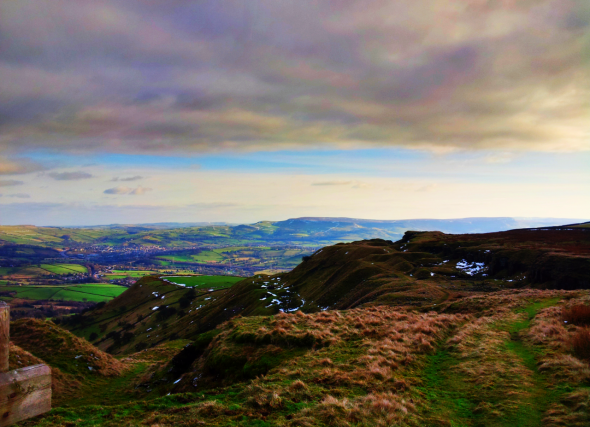 Posted in WalkingTagged chinley churn, countryside, dark peak, high peak, hiking, hill walking, hills, landscape, peak district, photography, snow., spring, walking, winter.